It was, by all accounts, a beautiful late summer morning. The temperatures were in the upper sixties, and the sun shone brightly against a brilliant blue sky. 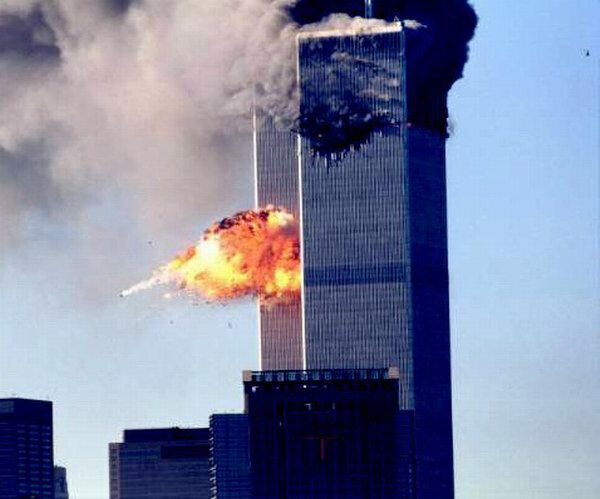 At 8:46, American flight 11 traveling from Boston to Los Angeles crashed into the North Tower. There were 91 passengers aboard. At 9:03, United Airlines flight number 175 flew into the South Tower. It carried 65 passengers, as it travelled from Logan Airport to Los Angeles. Then, at 9:30, American Airlines flight 77, which carried 64 passengers, crashed into the Pentagon. A total 2,996 people died, including the 19 hijackers. At 10:10 a.m., United Airlines flight 93 crashed in rural Shanksville, Pennsylvania killing all 44 passengers aboard. I thought we might consider those events ten years ago, about the consequences of that day, and particularly the changes in our spiritual lives as a result of that morning. Among those consequences, our nation has been at war for the last ten years. 4,442 soldiers gave their lives in Operation Iraqi Freedom, and over 1,600 died in Operation Enduring Freedom. It is extremely difficult to estimate the number of civilian casualties of these wars, but most calculations range somewhere between 150,000 and 1.2 million. Estimates of the costs of these wars range between one and three trillion dollars, and they continue to mount. We mourn the deaths of the 2,996 Americans who lost their lives ten years ago, and we may also mourn the hundreds of thousands of Iraqis and Afghans who have died since then. We might also mourn the shameless treatment of prisoners in Abu Ghraib, and the wisdom of a place like Guantanamo Bay. We might mourn the loss of our civil liberties in the Patriot Act and the Foreign Intelligence Services Act, which now authorizes searches of emails and wiretapping without judicial review. We actually engaged in a national debate about whether torture was acceptable, and somehow that debate seemed to hinge on a cost-benefit analysis. The September 11 attacks led to a remarkable resurgence of faith, or at least faithful activity. People across the nation filled our churches and rediscovered a need for a spiritual answer to a very worldly problem. We are right to wonder why people turn to God in times of crisis, but cannot sustain that conversion. The biblical witness, however, teaches that we have been doing that for thousands of years. Somehow, as our fears are calmed and our wounds are bound, our spiritual indifference resumes. While time has healed some of those wounds, we have also acquired a sort of national amnesia about how sorrowful, broken and vulnerable we felt. All violent acts of injustice, acts of destruction, and the taking of innocent life find their origin in the attitudes of the human heart. Evil dwells within. Jesus told us it is not what enters in from outside that defiles a person but the things that come from within are what defile. (Mark 7:15). The great cosmic struggle between good and evil, between light and darkness, between peace and war, between harmony and violence, between love and hatred, begins first in each human heart, is waged there – and true peace depends on the outcome. There’s a certain irony in the name of the massive bureaucracy we created in the wake of September 11: the Department of Homeland Security. To create that department and fund our wars, we have incurred a national debt of trillions of dollars. We might well ask about the security risks posed by that debt. I suspect the people of Jericho felt very secure behind their walls, and the Philistines probably felt very safe with Goliath on their side. The Egyptians probably rightly thought of themselves as a superpower as they approached the Red Sea. I wonder if we really ever will achieve security, and I think the Scriptural witness suggests that our only security, our only real safety, lies in God. Our spiritual efforts to move forward and get past that day may require us to take a great many risks. Then again, the Cross is full of just such risks. This entry was posted in Uncategorized and tagged Anglican, Bible, Disciple, Charity, Christianity, Death, Desmond Tutu, discipleship, Dominican Order, Episcopalian, Forgiveness, Gospel, Love, Moral Theology, National security, Religion, Scripture, Security, September 11, Spirituality, Theology. Bookmark the permalink. This is an incredible article. Thank you for it. For one who is convinced that the battle over good and evil was waged and won on Calvary, it is difficult at times to see the Kingdom which has come—still needs to come–that we are so still disobedient in light of Christ’s complete obedience on our behalf. Lord have mercy. Christ have mercy. Lord have mercy. This was the text of my class this morning. Thank you for your kind remarks. Amen! Thank you for this very thoughtful post, James. Thank you for sharing this post, James. You are most welcome, Thurma.